I’m usually the last to finish my dinner even though I’m one of the first to sit to the table. Why? Because of my diabetes meal time ritual. Every time I eat. As I make my way to sit at the table, I grab my diabetes kit from the kitchen counter and my glass of water. I sit and then push my plate away from me to make room for checking blood glucose levels and the maths. I take out my meter, put a test strip into it. 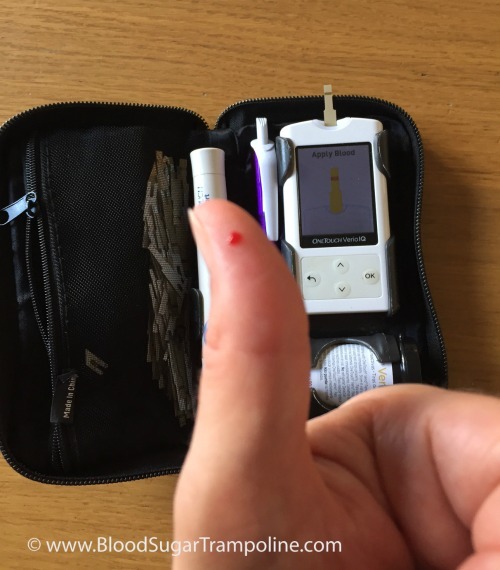 I take out my lancing device to prick my finger and squeeze the drop of blood onto the strip. Wait 5 seconds for the result. I used to input the result into my insulin pump with the number of grams of carbohydrate I’m about to eat so that it does the math for me. But these days, the number is sent via bluetooth to my pump, however I use an App on my phone to help me do the “sums”. I think about if I need to make a adjustment to the math depending on what type of carbohydrate I’m about to eat or what my activity plans are after I eat and make the adjustment. This ritual can take anywhere from 2 minutes to five. Meanwhile everyone is happily eating and chatting. Recently, I thought about what my children are thinking about as I complete this ritual every day or do they not pay any attention anymore. I do occasionally get a “oh that’s new” comment if I’ve changed my meter; sometimes that comments comes when the meter is actually new and sometimes this comment is made when the meter is not so new anymore. My children know this as normal but when their friends are over they are asked questions about what I was doing. They don’t think anything of it which is a relief to me. And I hope with all my heart that I never have to ask them to do this for me. For me this is everyday with diabetes.